AKRON, Ohio -- Two salons, a pet store and a Great Clips will join 365 by Whole Foods at the West Market Street Station, on the site of the former West Point Market. The new retail center, located at West Market Street and Hawkins Avenue, is slated to open the summer of 2017, according to a press release. 365 by Whole Foods made news when it was announced last year. The 30,000-square-foot grocery store isn't a typical Whole Foods; it's marketed as more accessible and budget-friendly. Developed by S.J. Collins Enterprises (SJCollinsEnt.com), a commercial real estate development firm, the Whole Foods Market at Peachtree Crossing has achieved a Green Globes® rating by the Green Building Initiative™. The team, including Phillips Architects + Engineers, practiced an integrated design process by involving key design professionals from the start. The design took measures to reduce the ecological impacts, including the use of efficient irrigation strategies. Local species of trees, shrubs and other drought-tolerant plants were introduced to conserve water consumption, and green walls were installed to keep the exterior walls at an optimum temperature. Hairstyles and healthy attitudes — along with pet care and Italian cuisine — will fill up the new retail space accompanying 365 by Whole Foods when the complex opens this year in West Akron. The stores together will form West Market Street Station, the development nearing completion at the former site of West Point Market. Commercial real estate development firm S.J. Collins Enterprises on Wednesday released an update confirming several leases have been signed for the site. The developer behind a Whole Foods 365 mixed use project in north Decatur has confirmed several new tenants that are expected to join the grocery store. Jeff Garrison, a partner with developer S.J. Collins Enterprises, confirmed that the restaurants gusto! and Takorea will be tenants in the North Decatur Square project. Additionally, there will be a pet food store, Hollywood Feed, and a dental practice, Sage Dental. S.J. 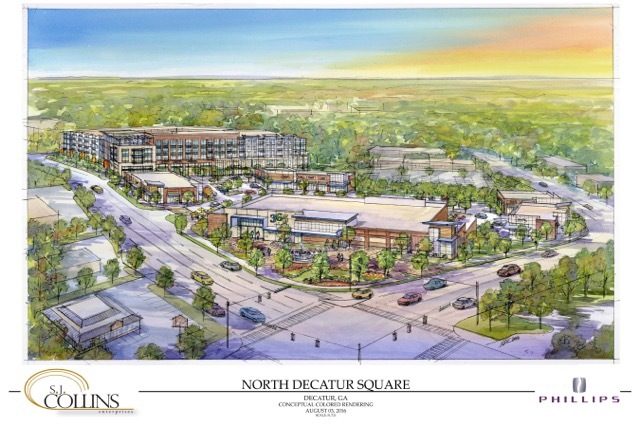 Collins Enterprises has announced five retail tenants for North Decatur Square, the mixed-use development northeast of Decatur city limits that’ll be anchored by a 365 By Whole Foods store. The businesses are Avalon Nail Spa, gusto! Wood Fire Grill, Hollywood Feed, Sage Dental and a Mexican/Korean restaurant called Takorea. All are expected to open in fall 2018. S.J. Collins partner Jeff Garrison said the 11-acre development will eventually include a bank and two more restaurants new to metro Atlanta.